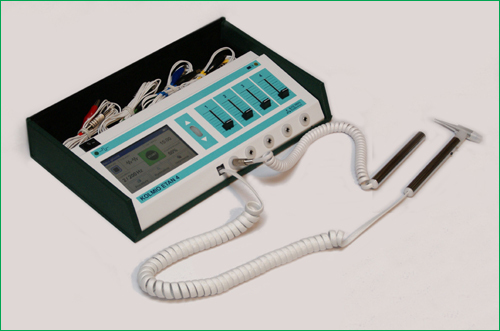 Electrostimulator KOLMIO ETAN 4 is a handy, portable device for electrostimulation of acupunctural points, for physiotherapy and for TENS electrostimulation. Simple usage, small dimensions and versatility enable even people without knowledge on acupuncture to use KOLMIO ETAN 4. Having concern about such users, the device was equipped with an automatic detector of acupunctural points. curing rheumatic, neurological and other illnesses. The use of the device is comfortable and the work parameters are stable and reliable thanks to the ergonomic design and modern digital techniques. The KOLMIO ETAN 4 device can be connected to the computer. You can use the computer program to create and use simple and advanced healing therapies. special shape of electrical impulses, which increases the effectiveness. medical user's manual - book "Your Health in Your Hands"